Did you know you can whip evaporated milk to create a slimmer version of whipped cream? Evaporated milk is a lower-fat substitute for half-and-half, light cream or heavy cream. It’s also super convenient since it’s a pantry staple, and shelf-stable. Whipping evaporated milk is much easier than I expected! You only have to chill the milk well, then whip for several minutes with a mixer, adding any flavoring you like (I like to add Cognac and lemon) and a little bit of sugar (powdered and granulated both work fine). Watch the video above to see how easy it is to whip evaporated milk. POUR evaporated milk into small mixer bowl; place beaters into mixture. Freeze for about 30 minutes or until ice crystals form around edge of bowl. Meanwhile, place about 1 cup fruit in each of eight dessert dishes. BEAT evaporated milk on high speed for 1 minute or until very frothy. Gradually add sugar and lime juice; continue beating for 2 minutes or until mixture is stiff. 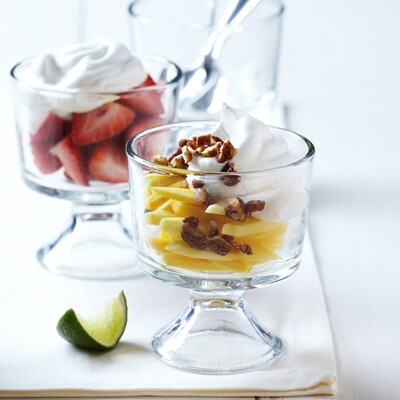 Immediately top each serving of fruit with about ½ cup whipped topping. Sprinkle with nuts. NOTE: For whipped evaporated milk that holds up to 30 minutes: Sprinkle 1 teaspoon gelatin over 2 tablespoons water in small, microwave-safe bowl; let stand for 2 minutes. Microwave on HIGH (100%) power for 40 seconds; stir. Let stand for additional 2 minutes or until dissolved. Pour 1 cup evaporated milk and dissolved gelatin into small mixer bowl; follow recipe above. Serve immediately or cover and refrigerate for up to 30 minutes. Did you know you can whip evaporated milk to create a slimmer version of whipped cream? Evaporated milk is a lower-fat substitute for half-and-half, light cream or heavy cream. It's also super convenient since it's a pantry staple, and shelf-stable. Oh this is great! I never knew you could whip evap milk!! I always have a ton of it on hand because it’s the only addition hubby and I make to our coffee. Thanks so much for the tip and the recipe!! Had no idea you could whip evap milk! Can’t wait to try!